After a certain point in the story, Final Fantasy XV involves leaving Lucis and going to Altissia, with no way to come back. Luckily, after a while, you’ll get an option to go back to the open world whenever you want. It’s not obvious, but it’s easy. Once you know how to do it, you won’t have any trouble returning to the past. In this guide, we’re going to show you how to get back to open world after Final Fantasy XV ends. Load up your last save. It will have a different background than the earlier ones, signifying you’ve beaten the game one it. Go to a rest point. 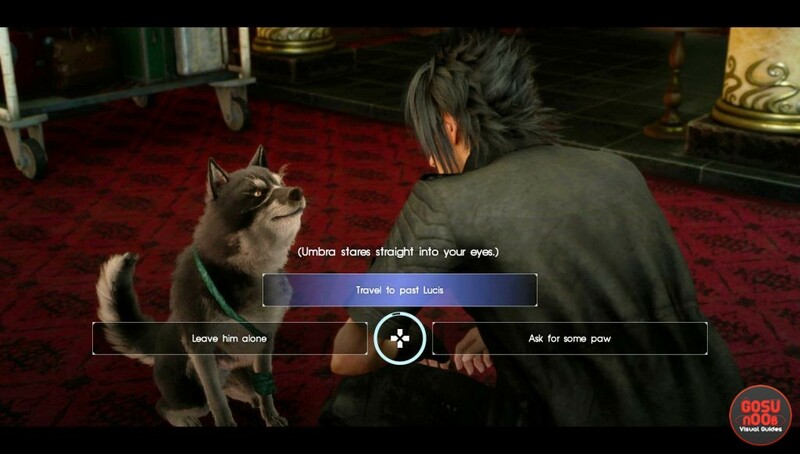 Choose the option to Talk to Umbra. Select to be taken back to the past. If you want to revisit Altissia, you’ll also need to use Umbra. You won’t have to travel by boat again. Simply rest at a resting point, talk to the dog and let him warp you there. If the option isn’t there, try loading another save file. It should be present – if it’s not, it’s most probably a bug. There are certain points near the end where you won’t be able to use this ability. If you try resting in Insomnia, and you don’t have the option to talk to Umbra, that means you’re stuck there until you finish the game. Once you’re done with the story, the option will reappear. Certain quests will only appear after you’ve finished the game, so it’s worth revisiting old locations even after you’ve left Lucis. One of those quests will unlock secret dungeon doors and let you descend further into them, to fight stronger enemies and get great prizes. Hi! Is it possible to get somehow to present Lucis full of deamons? It is possible, but you’ll have to progress with the main story once again.